The world-famous beaches of Florida's Sun Coast are moments away from Oak Springs RV Resort. Nearby are major tourist attractions of Central Florida: Busch Gardens, Weeki Wachee Springs, and the Greek Sponge Docks. While away your leisure hours! 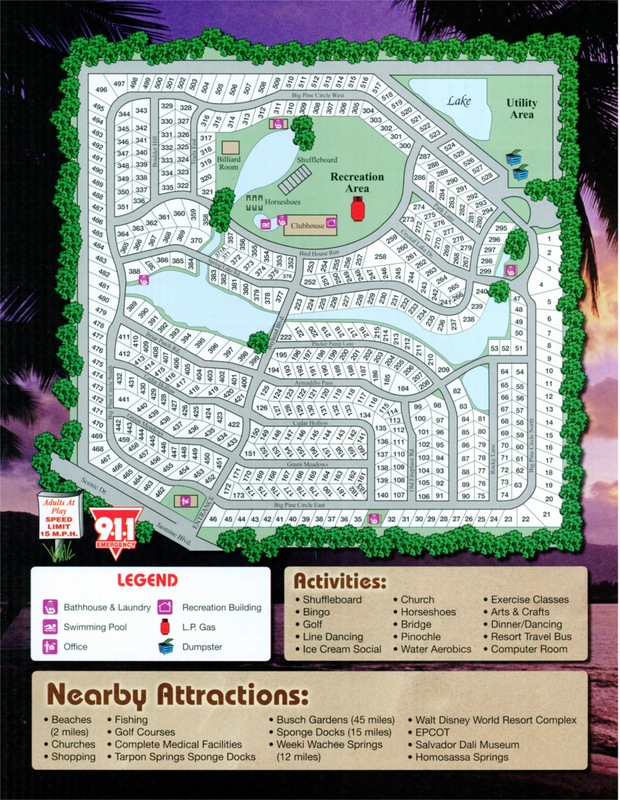 Golf courses, beaches, marinas, restaurants and shopping are close by. Come share the sunshine... it's our way of life! ​All of the Activities & Amenities You Want... And More! Rates based on 2 person occupancy. Extra person fee $3.00 per night; $35.00 per month. Written leases are required on all 6 + 6 and yearly rents. A 5% discount is given on all leases paid in full prior to April 1st of each year. Does not apply to credit card payments. All sites are complete with water, sewer and electric service. Yearly and 6 + 6 residents are billed by Duke Energy for electric service. Monthly residents are billed and payable on or before the 5th of each month.